When is your baby due? This is one of the most common questions that confront expectant mothers. It can be difficult if you don't know how to calculate the due date. Don't worry. You don't have to contend with nagging friends, colleagues or relatives, or count the days on your fingers or open your phone calendar. The following calculator can help you out. To determine your due date correctly, you must have been keenly tracking your ovulation. Otherwise, there is no way to determine with certainty when you ovulated and conceived. Your date of delivery is calculated by adding 280 days (40 weeks) to the first day of your last menses, assuming your cycle is 28 days. Here is a fun fact: your menstrual period and ovulation are counted as the first two weeks of pregnancy and therefore when you deliver on your due date, your baby will actually be 38 weeks old and not 40 weeks as is the assumption. To calculate your expected date of delivery, use this calculator. The following are some common questions besides how to calculate due date. 1. Will My Baby Be Born on My Due Date? 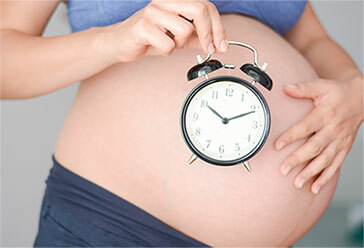 Unfortunately, there is no way to determine the exact time of your baby’s arrival. The due date is only an estimate, and your baby will come when he/she is ready. On average, only 5% of births happen on the estimated due date. Otherwise, your baby may arrive a week before or after the estimated due date. A healthy pregnancy can last between 38 to 42 weeks. 2. What If I Have Irregular Periods or Long Cycles? In case your cycle is longer than the average 28 days, you can still use a pregnancy wheel and perform simple calculations to determine your due date. Usually, the second half of a cycle lasts for 14 days. So if your cycle is 35 days, then you probably began ovulating on day 21. Once you have a general idea of this, you can use an adjusted LMP (last menstrual period) to calculate your expected due date on a pregnancy wheel. • Then add 280 days to the adjusted LMP to find your due date. 3. How Else Is My Due Date Calculated? An ultrasound – When performed early enough, an ultrasound can determine the due date more accurately. Not all women can get an early ultrasound. However, it is recommended if your periods are irregular, you have a history of miscarriage and pregnancy complications, or your due date can’t be determined based on your last menstrual period (LMP) or physical exam. The size of the uterus – This is noted during the first physical exam. Pregnancy milestones – e.g. the first time the fetal heartbeat is felt, which is usually 9 to 12 weeks into pregnancy. Or the first time the baby starts to kick which is about 16-22 weeks of gestation. Fundal height – That is the top of your uterus. Your practitioner will be able to determine this in every prenatal visit. The fundus should reach your naval by week 20. This helps to determine your due date. Does It Matter If I Go Past My Due Date? There is absolutely nothing to worry about if you go past your due date. About half of all newborn births are late arrivals, and this doesn’t necessarily mean that they are late. Maybe your knowledge on how to calculate due date was not accurate. Only about 7% of births are truly overdue. Most obstetricians and gynecologists confirm that the due date gives a rough idea since women are different and the menstrual cycle varies from person to person. Your body is beautifully configured to know when to go into labor and therefore you should not be concerned if you are past your due date. Our bodies become less accommodating to the fetus after 42 weeks. The baby gets less oxygen and nutrients as your body reduces production of amniotic fluid. Past 42 weeks, pregnancies have an increased risk of a C-section. Your baby may also poop in the amniotic fluid and breathe it in, which may cause some difficulties after birth and in rare cases, lead to stillbirths. To prevent this, many obstetricians induce birth if the pregnancy is past 41 weeks, and the cervix is ready. Others may instead choose to perform frequent tests up until the baby arrives to find out if the uterus is still adequately hospitable for the baby. You can discuss these options with your care practitioner if you go past your due date. Are Vinegar and Pregnancy Compatible? Can You Eat Mozzarella During Pregnancy?